Along with a vodka Bloody Mary and a tequila Bloody Maria, this wildly popular Chicago eatery serves a whiskey-based “Bloody Lawrence” — known affectionately as the “Bloody Larry.” Brunch bartender Marta Jean Evans devised a base that incorporates tomato, horseradish, pickle juice, Frank’s hot sauce, Old Bay, and St. Ambrose Oatmeal Stout, boozed up with Mellow Corn Whiskey and garnished with a cube of cheddar cheese and a cornichon pickle. Miso is the secret ingredient that gives Carl York and Brenda Jarillo’s “KTT Bloody Mary” texture and umami, tempting drinkers to go for another round. It joins tomato juice, Worcestershire, horseradish, and cucumber-infused Damrak gin — all crowned with Kirkland’s garden pickles. (A bit of pickle juice makes it into the drink itself, too.) The garnish cornucopia currently includes beets, cauliflower, green beans, turnips, and corn. At a glance, it’s hard to believe there’s tomato in the transparent “Bloodyless Mary” at Daniel Patterson’s Oakland bar and eatery, but when you taste it the classic Bloody flavors are loud and clear: The restaurant blends Dirty Girl Farms tomatoes with celery salt, fresh horseradish, ground pepper, and a “tamardino sauce” made with tamarind, fish sauce and spice. After that mix steeps, it’s strained through cheesecloth to clarify. It’s then spiked up with barrel-aged Tito's Vodka and garnished with cherry tomatoes and sea beans. 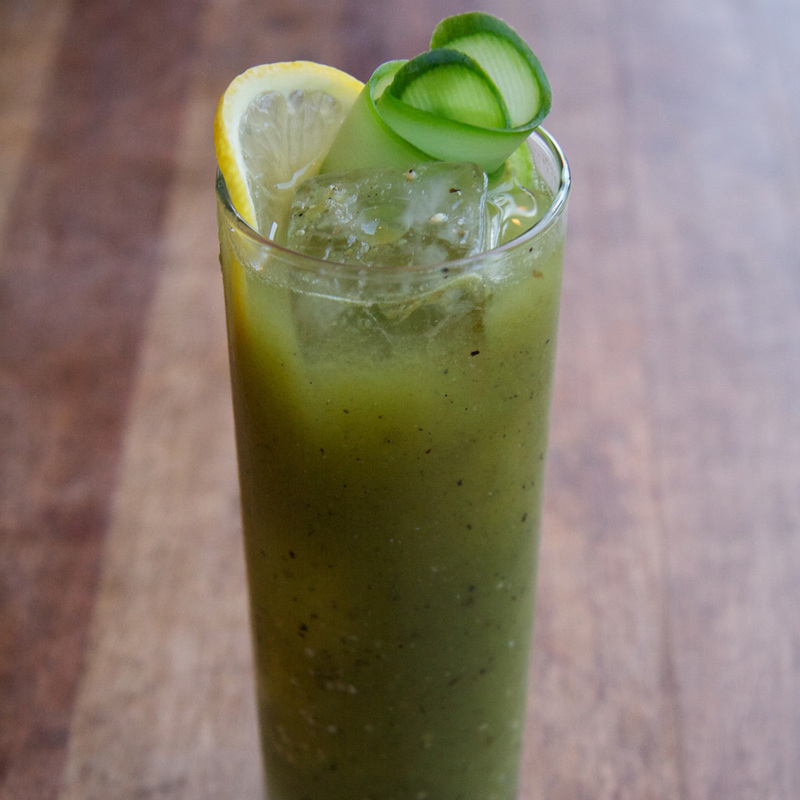 LA loves its green juices, so it’s only natural that someone in the city would come up with a Green Bloody. Rather than tomato, The Cannibal’s Bloody is made with fire-roasted tomatillo — along with cucumber, onion, celery, cilantro, parsley, and jalapeño. They’ll spike it with any spirit; head bartender Dan McClary recommends mezcal for its smokiness, rhum agricole for its green, vegetal flavor profile, or gin for its herbal botanicals. There’s a distinct Scandinavian flavor to this “Bloody,” as it’s known on the menu, thanks to the savory-herbal spirit aquavit. Head bartender Robb Jones creates the base from ripe tomatoes, fresh horseradish and dill, English cucumber, and a housemade dried shiitake powder; dill, cucumber, and lemon top it off. 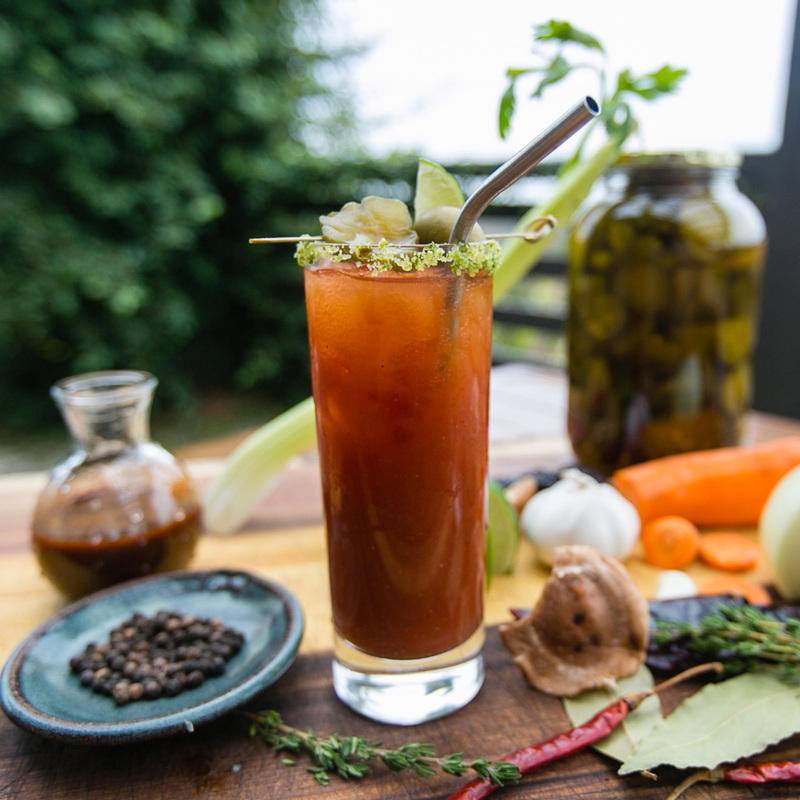 This beloved roadside eatery boasts the best Bloody in wine country: The “Spicy Bacon Bloody Mary” is bartender Jamin Hollabaugh’s concoction of tomato, vodka, and a “secret spice blend” he refuses to divulge. 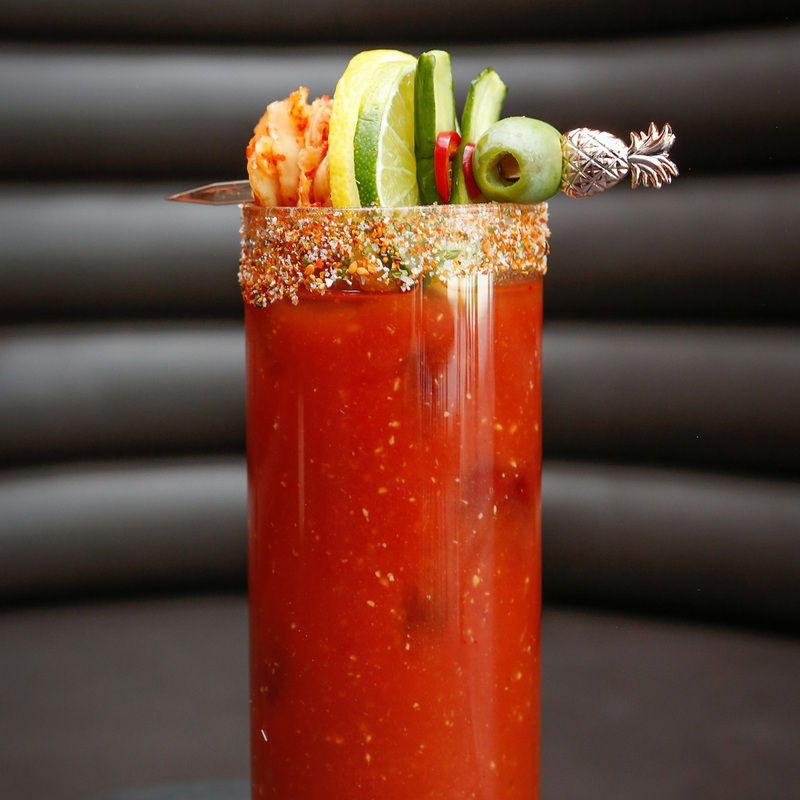 Key to the drink’s appeal is a celery salt rim and a garnish of applewood-smoked bacon. Best consumed with a plate of Boon Fly’s famous doughnuts. 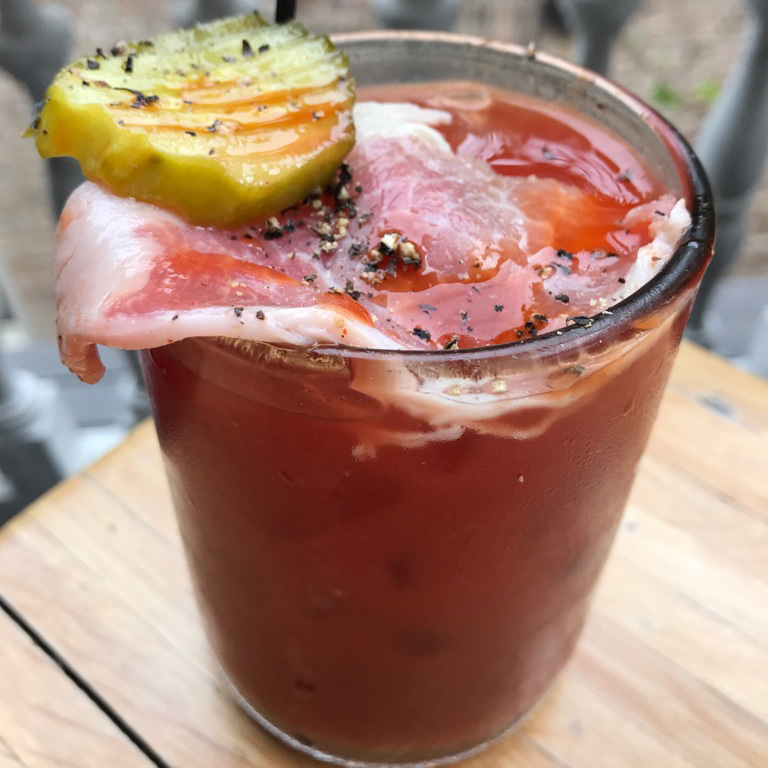 Chef Sean Brock is known for his love of Southern meats, so it’s only fitting that the Husk Bloody Mary at this Charleston restaurant is garnished with country ham. It tops a refreshing, vegetable-heavy drink of tomato, celery and onion juice, carrot juice, parsley and watercress juice, lemon and horseradish, and a good pour of vodka. This Bloody Maria takes its cue from sangrita, the tomato-citrus elixir often served alongside shots of tequila. 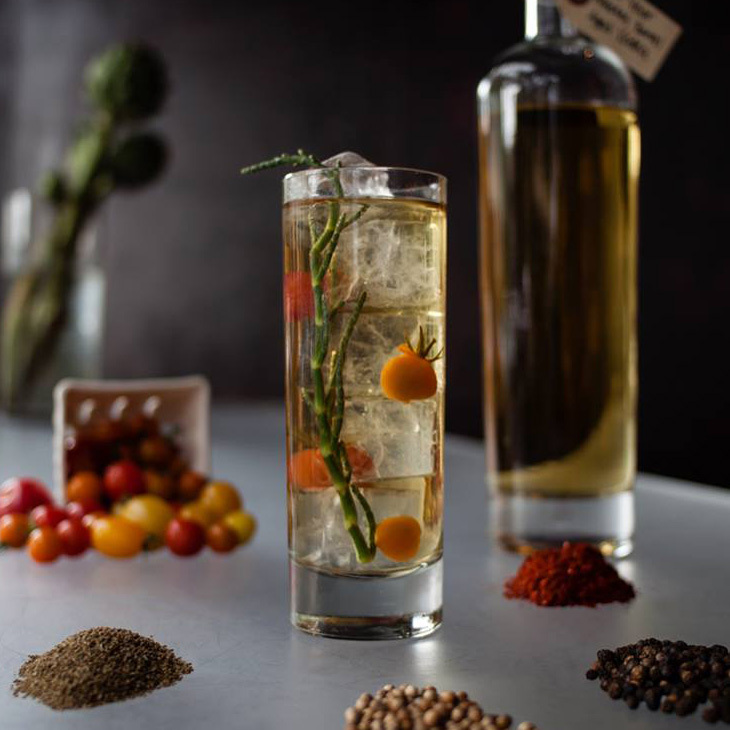 At Nopalito, it’s a blend of tomato, orange, and smoked jalapeño vinegar — made from jalapeños smoked over almond wood for hours — spiked with Pueblo Viejo Blanco and served with a salted rim. 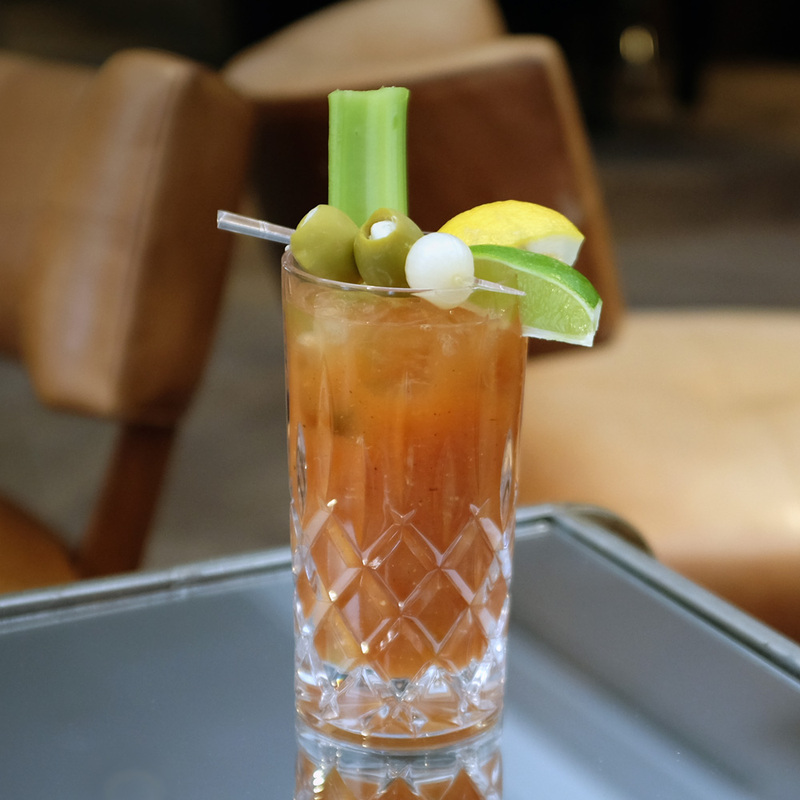 The Riverpark Farm supplies produce for dishes across the menu at Tom Colicchio’s East Side restaurant, so it’s no surprise they fuel the Bloody Mary, too. Peppers from the farm, including Scotch Bonnet, jalapeño, amarillos, and Carmen Sweets, are fermented and then blended with tomato, black pepper, lemon and fresh horseradish. Garnished with a classic celery stick. This Denver restaurant incorporates flavors from across Asia—namely Thailand, Korea, and Japan— for its signature Bloody Mary. Created by restaurant manager Kenny Okada, it starts from a base of the Japanese spirit shochu and includes lemongrass, Thai basil, yuzu kosho, kimchi juice and a host of spices for a distinctly Asian-influenced character. 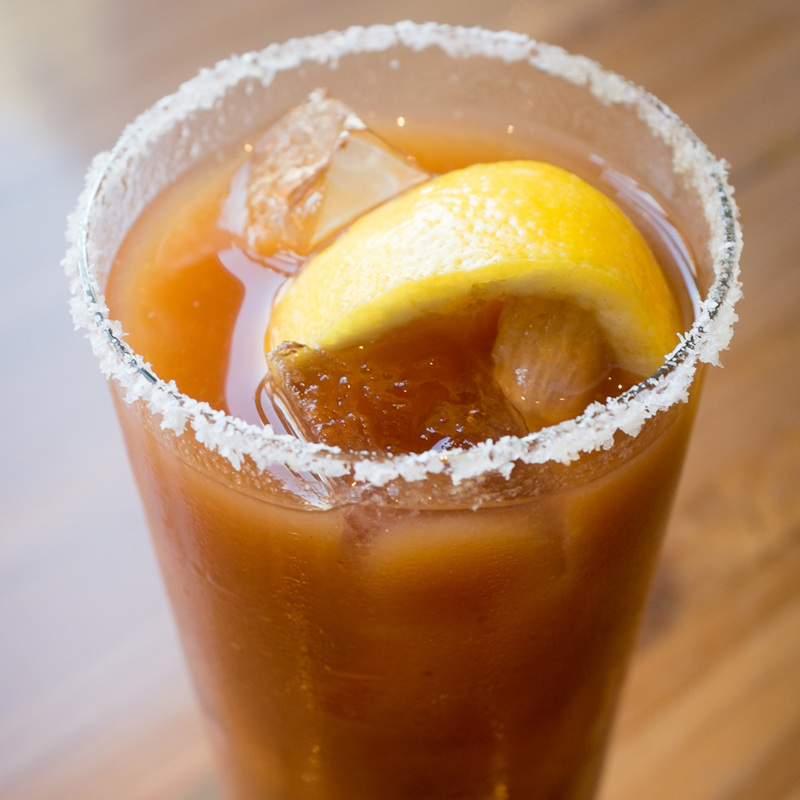 Saturday and Sunday brunch at this popular pork-and-beer hall call for a “Smokin’ Maria” — with tomato, lime, Worcestershire, horseradish, roasted garlic, and chipotle, spiked with both tequila and smoky mezcal. The elaborate garnish includes the Publican’s summer sausage, with pickled hot peppers and carrot; a beer back comes along for good measure. A cocktail, or a meal? 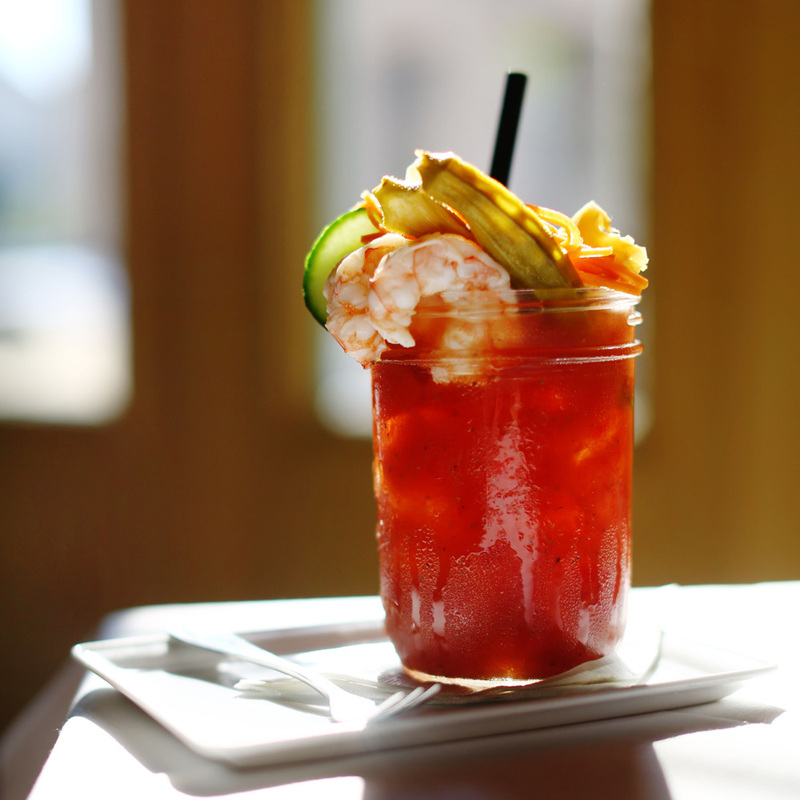 The “Big Red Hammer” at this New Orleans favorite starts with housemade Bloody Mary mix and Tito’s, but the real stars are the poached shrimp, blue crab claws, and house pickled vegetables that top the drink. Lest these components be mistaken for just a garnish, the beverage is served in a Mason jar — with a fork. 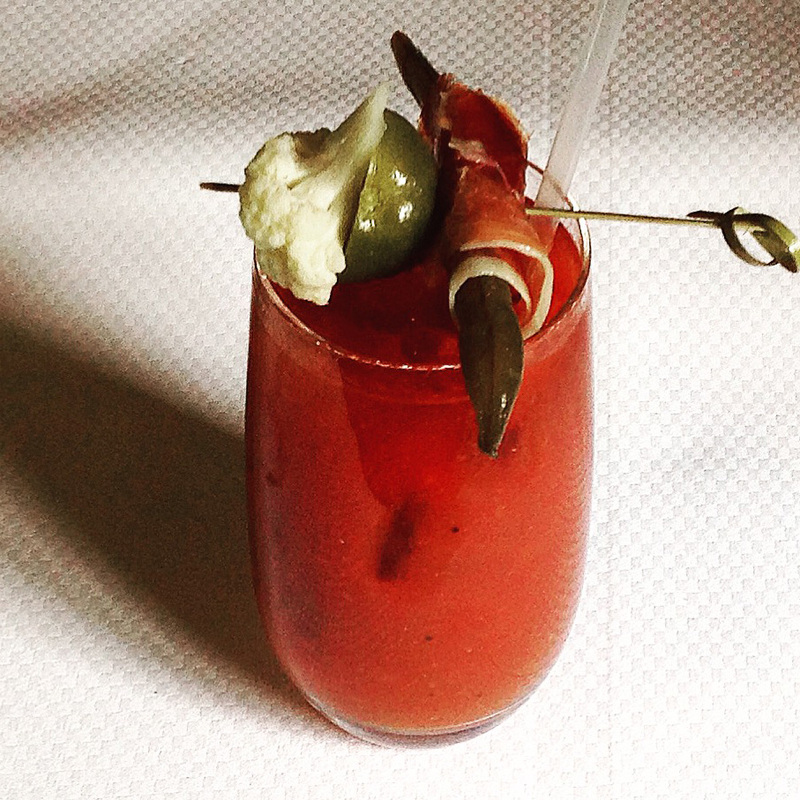 Brunch is a huge draw at Tory Miller’s gastropub, not least due to the appeal of its proudly Midwestern Graze Bloody Mary. 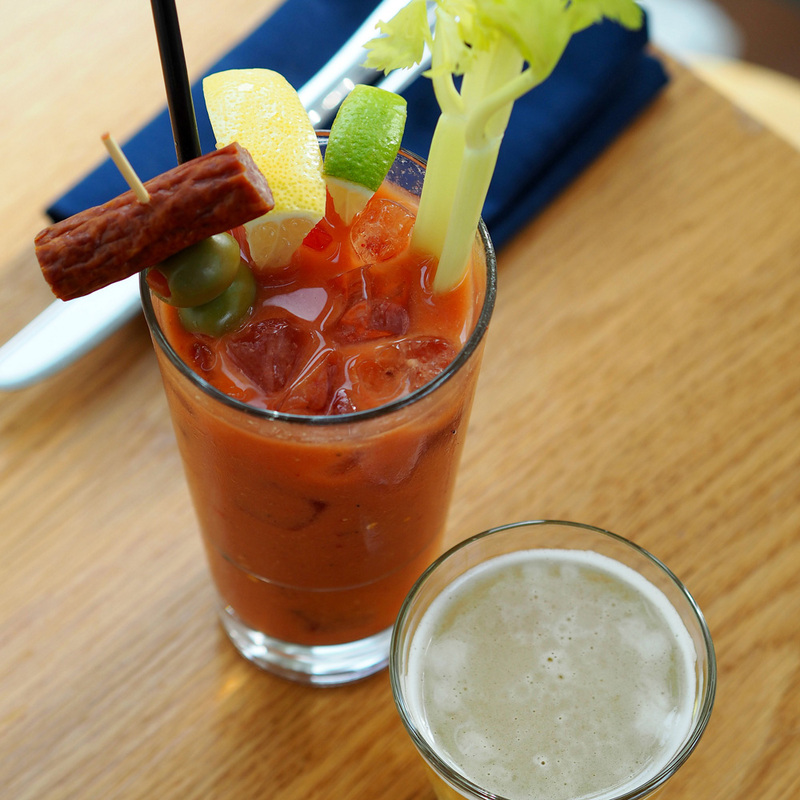 Tomato, horseradish, and Worcestershire are joined by Dijon and pepperoncini juice, vodka, and a showstopping garnish of house-pickled asparagus, a locally made jalapeño beef stick, olives, celery, and a Wisconsin cheese curd. A New Glarus beer back is the final touch. 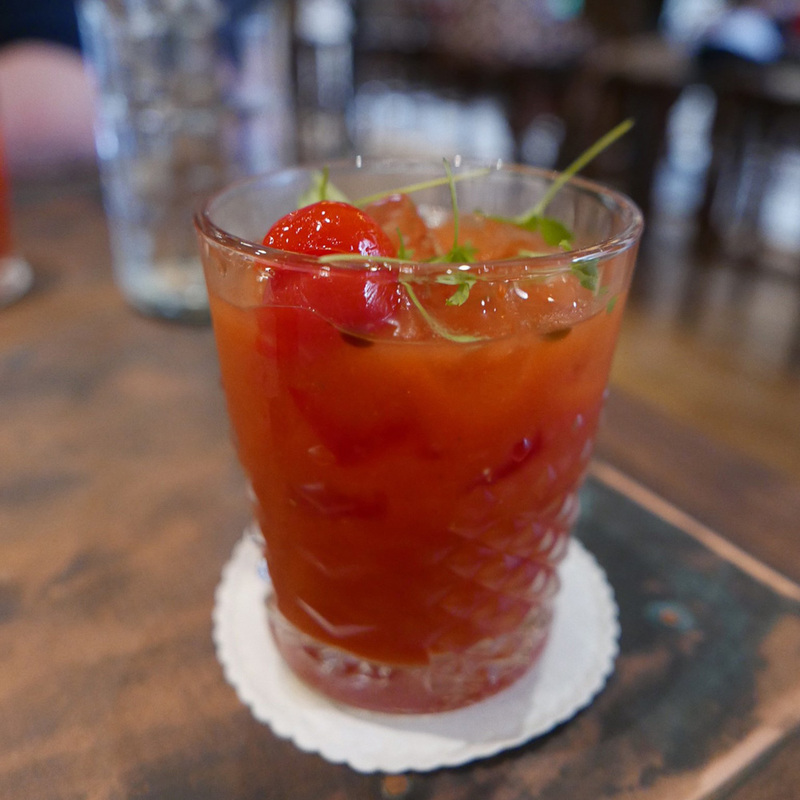 The restaurant’s own preserved tomatoes form the base of the Tavern Bloody Mary, but things get more interesting from there: the drink also includes the tavern’s pepper sauce, ají dulce liquid, peppadews, charcoal roasted peppercorns, and lactart for acidity. Boozed up with gin, it’s topped with lovage and lovage oil, as well as a whole peppadew. 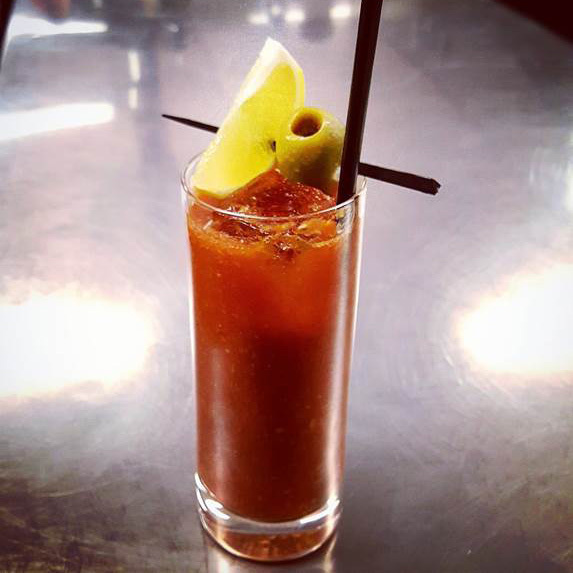 Umami is the star of the SpringHouse Bloody Mary, built from a base of mushroom-vegetable-chili broth, together with tomato juice, Worcestershire, celery salt, and citric acid. Vodka joins the party, lime and olive top it off, and the glass is rimmed with SpringHouse’s herb salt, with parsley, fennel, citrus zest, and chile de árbol. This modern steakhouse’s expansive terrace is the ideal setting for a vegetable-heavy Bloody Mary — carrots, celery, yellow onions, and jalapeños roasted and caramelized, giving the drink a smoky depth, then blended with horseradish and Tabasco. Tito’s vodka and a classic olive-celery-lemon garnish finish it off. This northern Italian restaurant’s culinary focus extends to its “Tyrolean Mary” — topped with smoked ham speck and whichever fermented vegetables are in the larder (ranging from pickled carrots to compressed celery to fermented broccoli stems and pickled cauliflower). 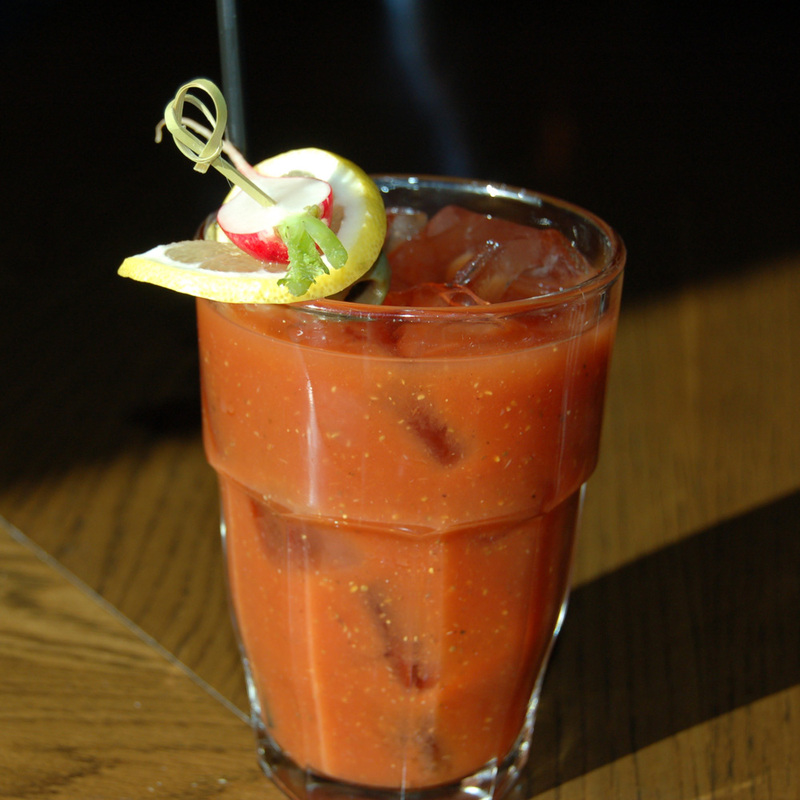 The Bloody mix picks up heat from horseradish and Calabrian chilies, blended with tomato, lemon, and ample salt and pepper, spiked with vodka to serve. 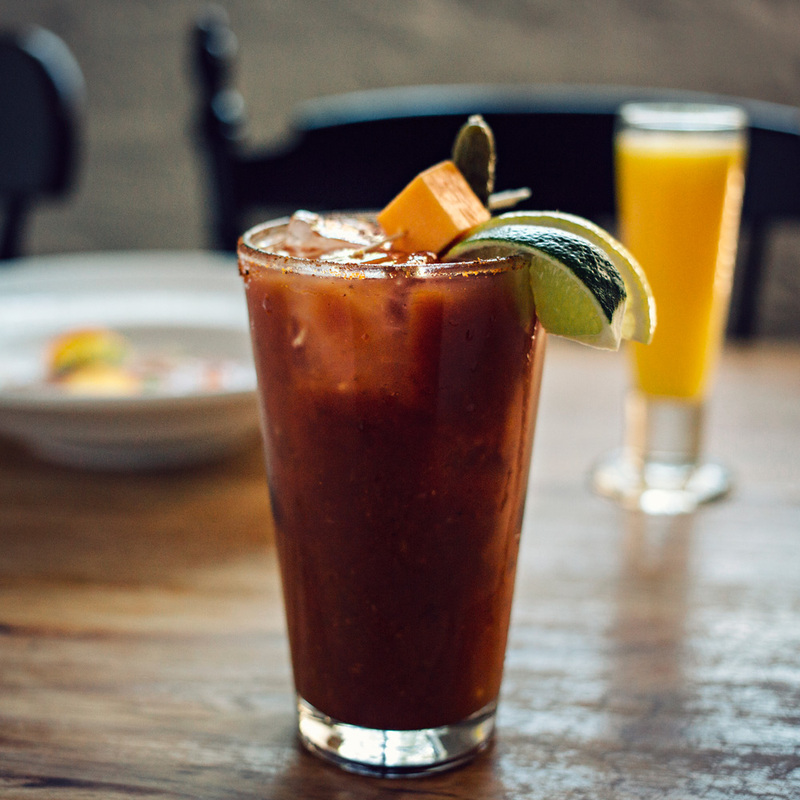 This vegetable-centric New York restaurant didn’t stop at one Bloody; brunch-goers can choose from the Bloody Carrie or the Jealous Mary. 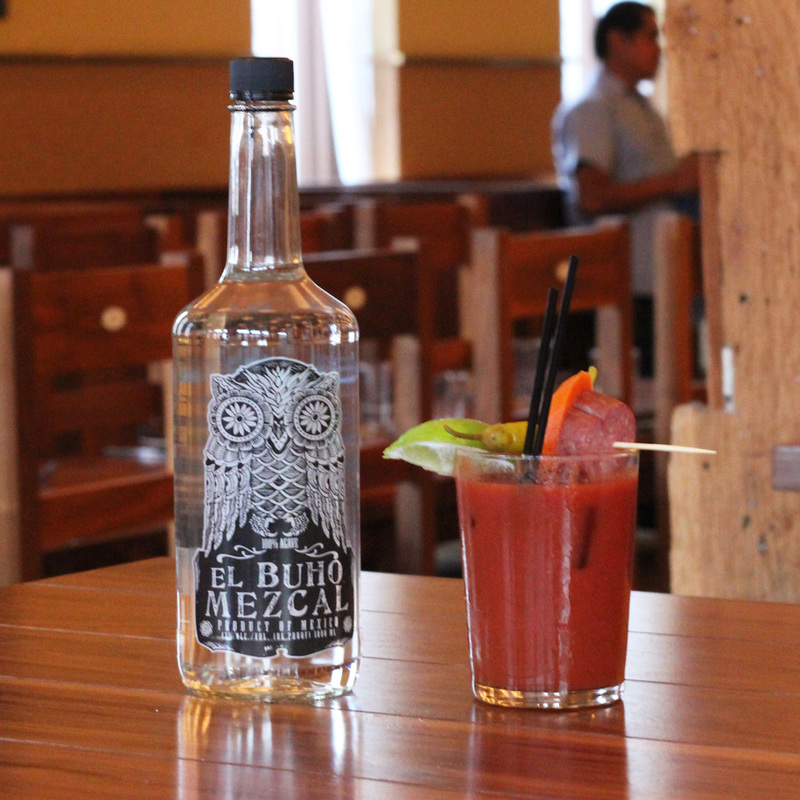 The former is based on grilled carrot juice, with tomato, smoked habanero hot sauce, and tequila and mezcal. It’s served with a guajillo chili salt rim and pickled carrots and tomato. 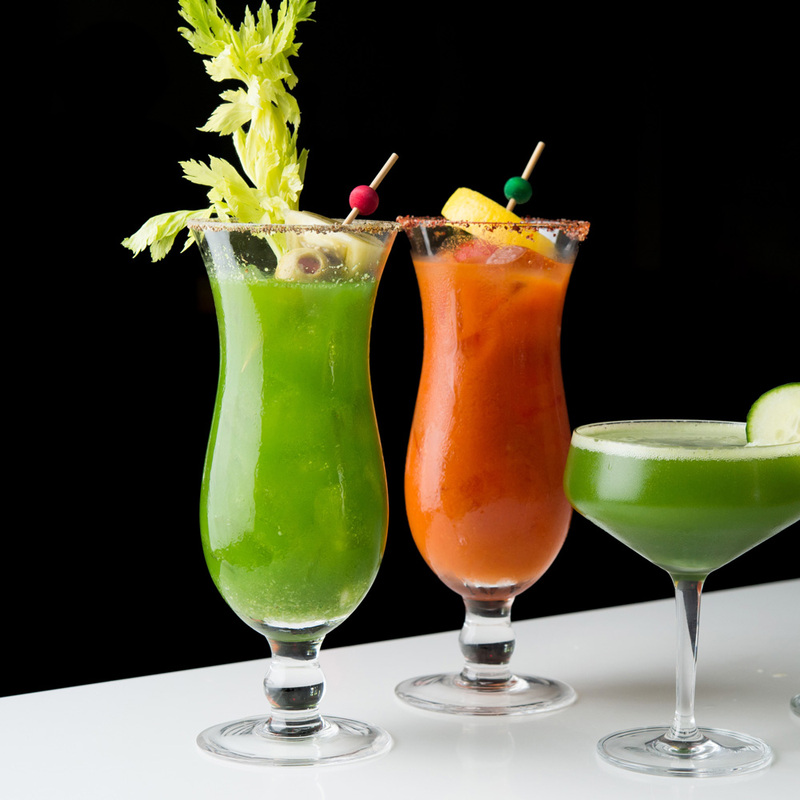 The green version—the Jealous Mary—is primarily green tomato and kale juice, along with green Tabasco and vodka, and is garnished with pickled green tomatoes. 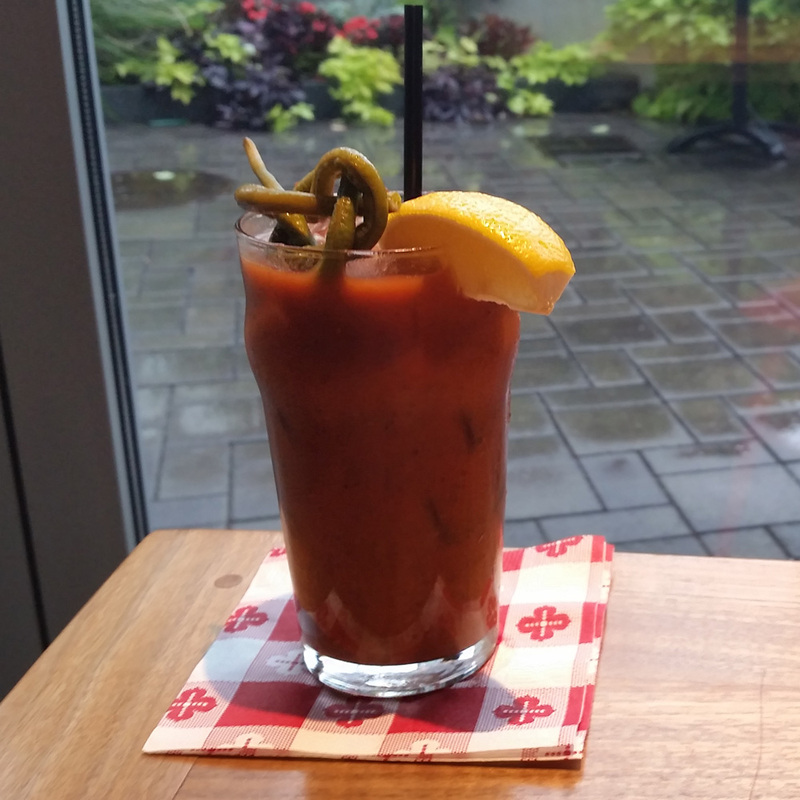 Molasses and chili brine are the “yin and yang” of Townsman’s Bloody Mary, according to bar manager Silas Axtell, contributing rich sweetness and savory spice to the drink. They’re blended up with tomato, cayenne pepper, paprika, lemon and lime juice, and both horseradish juice and pulp, plus Baboo's mustard, a spicy mustard from chef Matt Jennings’s family recipe. It’s finished with vodka and topped with whatever pickle is in season, most recently Chinese long beans. 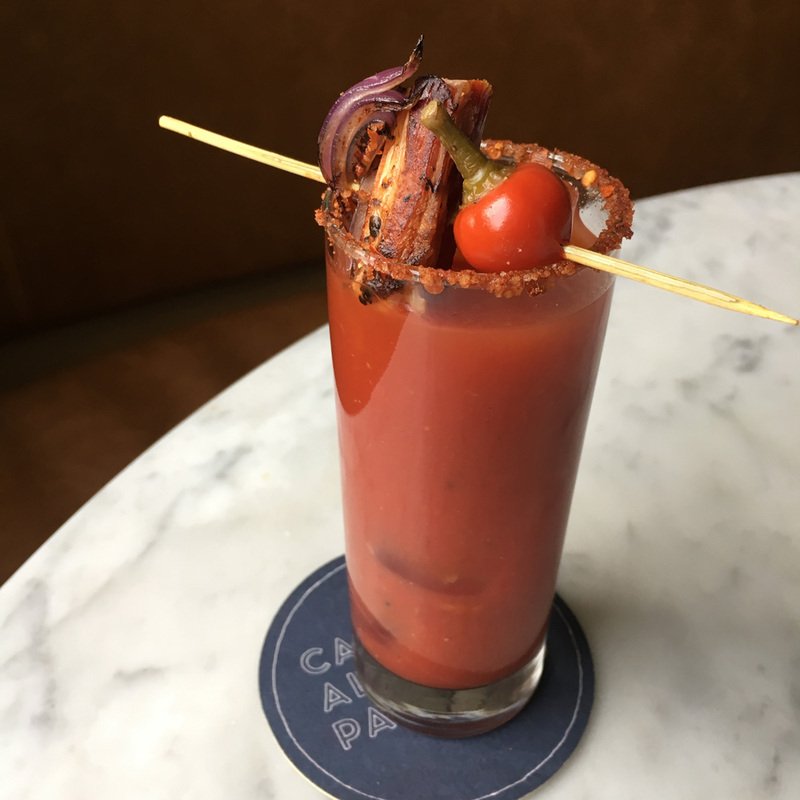 Expect a little pig with your Bloody at this modern Italian spot: The “ Amatriciana Mary,” made from a spicy base of caramelized onions, chili, and tomato, is loaded with Tito’s vodka and topped with a skewer of pickled onion and guanciale (cured pork jowl).